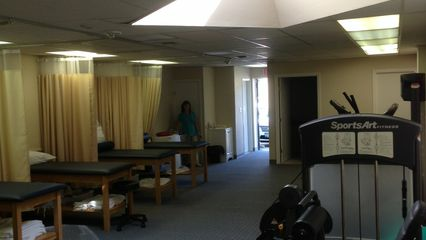 Michael (Mike) is a dedicated and experienced professional who has served the physical therapy field for 25 years. Over this time, Mike has earned a widespread reputation for excellence, integrity, knowledge and focusing on the needs and well being of patients. Prior to joining Farmingdale Physical Therapy East, Mike was on staff at NYUâ€™s Rusk Institute and Mt. Sinai Hospital. In addition to his current duties as Physical Therapist and Clinical Director in charge of patient development and clinic operations, Mike works part-time at the Smithtown Parkinson Therapy Center. Mike is a longstanding member of the APTA, with membership in both the Orthopedic and Neurology sections. Academically, Mike earned his A.A.S. as a Physical Therapy Assistant, and his Masters Degree in Physical Therapy. He has also taken numerous post-graduate courses to fortify his vast knowledge base. Mike is proud to call the Farmingdale community home, where he along with his wife raise their four children. Patricia is a highly knowledgeable and experienced Physical Therapist, and is renowned for integrating her passion for health and fitness into her treatments. Prior to joining the Farmingdale Physical Therapy East team in 2005, Patricia worked as an orthopedic Physical Therapist in White Plains, and then in Garden City. Academically, Patricia earned her Master of Physical Therapy degree (a 5 Â½ year program) from Quinnipiac University. She also frequently attends continuing education seminars and courses to advance her education, stay on top of changes in the dynamic medical field, and further refine her skills.In her spare time, Patricia enjoys spending time with her family, going to the gym, and going to the beach. She has recently developed a love for hiking, and enjoys visiting national parks. John Dugan is a recognized leader in the physical therapy field, where he has been practicing since 1979. Over the years, John has literally served generations of patients from the very young to the very young at heart and takes tremendous pride in being a trusted member of his patients' extended family. Prior to establishing both Massapequa Physical Therapy and Farmingdale Physical Therapy East (and immediately before that, Farmingdale Physical Therapy), John served on the staff at NYU's Rusk Institute. He also provided private home care and worked with the Visiting Nurse Service of NY. Throughout his career, John has always been a champion of providing quality patient service, and protecting the integrity of the physical therapy profession through its many ups and downs. John is a certified advanced Hip clinician and board member at the Hospital for Special Surgery Rehabilitation Network. He is also Board Certified in Orthopedics, Neurologic and Geriatric physical therapy. Academically, John earned his Bachelor Degree in Biology from Fairfield University, and his Physical Therapy Degree from Columbia University College of Physicians and Surgeons. John enjoys exploring the broader concepts of health, including exercise, eating well, cooking, and investigating other alternative therapies to maintain fitness and function throughout. He is also proud to be a lifelong resident of Farmingdale. Caitlin is an experienced and knowledgeable Physical Therapist looking to further expand her experience in the field while helping patients to reach their rehabilitative goals. Caitlin is known to be compassionate and capable of building strong, trusting relationships with her patients to give them the best possible outcome. Caitlin was a competitive Irish Dancer for most of her life. She started her journey in physical therapy as a patient, which ultimately led her to pursue a career in the field. Prior to joining Farmingdale Physical Therapy East, Caitlin worked in several outpatient clinics focusing largely on orthopedic rehabilitation. Academically, Caitlin earned her Bachelor of Science in Exercise Physiology from Adelphi University, and her Doctor of Physical Therapy degree from New York Institute of Technology. Caitlin attends continuing educations courses to expand her knowledge and continuously improve her manual skills as a therapist. In her spare time, Caitlin volunteers at an animal shelter and enjoys hiking, dancing, going to the gym and photography. Caitlin has also recently become a proud Farmingdale resident.